Valentina Vezzali was born on 14th February 1974 in Jesi. She is an Italian fencer and politician. As fencer she has won six Olympic gold medals in foil competitions. Together with the German shooter Ralf Schumann, the Slovak slalom canoeist Michal Martikán and the Japanese female judoka Ryoko Tani, is one of only four athletes in the history of the Summer Olympic Games to have won five medals in the same individual event. On 2013 she became a member of the Italian Chamber of Deputies as part of the Scelta Civica party. 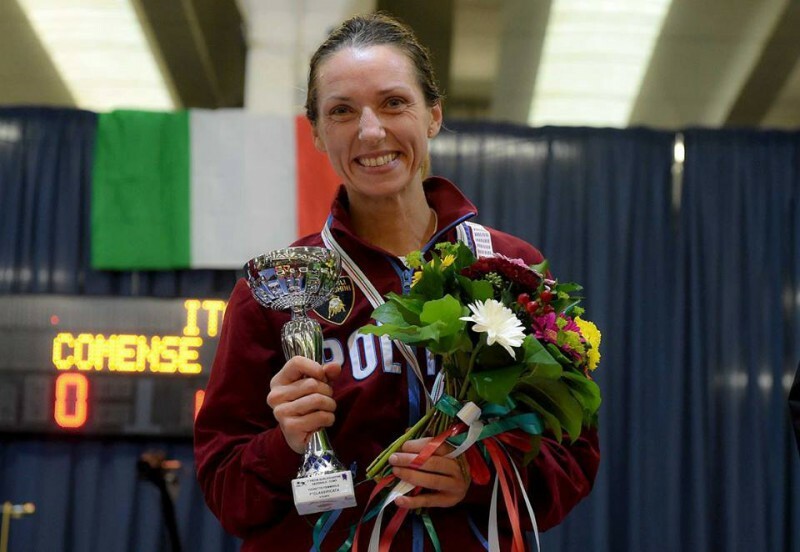 She is the most successful Italian athlete in the history with holding first position in the world ranking of the women’s foil for eleven years. Vezzali is the first fencer in Olympic history to win three Individual Foil gold medals at three consecutive Olympics – Sydney 2000, Athens 2004 and Beijing 2008. She also won fourteen gold medals at the World Fencing Championships, six in individual competitions (1999, 2001, 2003, 2005, 2007, 2011) and another eight in team competitions (1995, 1997, 1998, 2001, 2004, 2009, 2010, 2013), plus four silver medals (two individual, 1994 and 2006, and two with Italian team, in the same years) and three bronze medals (individual, 1995, 1998 and 2012). In European championships, she won nine gold medals (individual: 1998, 1999, 2001, 2009, 2010; team: 1999, 2001, 2009, 2010), three silver medals (individual: 2003, 2007; team: 2007), two bronze medals (individual: 1993; team: 1998). She published two autobiographies: A viso scoperto (“With uncovered face”), written with Caterina Luchetti in 2006, and Io, Valentina Vezzali, written with Betta Carbone in 2012. She married Italian soccer player Domenico Giugliano and has two sons: Pietro, born on 9 June 2005, and Andrea, born on 16 May 2013. On 25 February 2013 she became a member of the Italian Parliament as part of the Scelta Civica party led by Mario Monti. Since 2010 she is the Testimonial for AISM (Associazione Italiana Sclerosi Multipla), an Italian non-profit organization battling Multiple Sclerosis.